Since the European Commission’s decision to dismantle the Chief Scientific Adviser (CSA) in late 2014 to the official launch of the SAPEA project in December 2016, the work of the five European academy networks Academia Europaea, ALLEA, EASAC, Euro-CASE, and FEAM became a case of success of inter-academy cooperation at the European level. More than 100 academies are from now on connected within SAPEA, the EU-funded project “Science Advice for Policy by European Academies”, to pull together timely, independent and evidence-based scientific expertise for the highest policy level in Europe. The start of SAPEA also completed the establishment of a new comprehensive system of scientific advice for the European Commission under the Scientific Advice Mechanism (SAM). SAPEA’s architecture is the result of two intensive years of teamwork and collaboration amongst the European academy networks, but the pace of the project sped up since late 2015. In October 2015, the European Commission released a Horizon 2020 call addressing the five European academy networks. After numerous meetings to develop and refine the objectives of the project, the European academy networks finalised details on the joint application and submitted the proposal in May 2016, which was finally approved in November. The five academy networks’ Presidents, composing the SAPEA Board, in their first meeting elected ALLEA President Günter Stock as the Chair of the SAPEA Board. The chairmanship was established on an annual rotating basis. Academy networks have put in place the working structures of SAPEA concerning the management of science-based policy advice projects, administrative coordination, and communications. The first steps of what became SAPEA date back to November 2014 when the new Commission took office under President Jean-Claude Juncker, who discontinued both the Chief Scientific Adviser (CSA) and the Science & Technology Advisory Council (STAC) to initiate a full review of the characteristics and structures of the European Commission’s scientific advice system. The Commissioner for Research, Science and Innovation, Carlos Moedas, took the lead to reimagine the role of science in European policymaking and sought to establish an independent, transparent and well-resourced institutional structure to better feed science into policy. Following this opportunity, the five academy networks worked together to declare their preparedness to participate in this new endeavour. On 26 March 2015, ALLEA President Günter Stock and the Presidents of the partner organisations, Sierd Cloetingh (Academia Europaea), Jos van der Meer (EASAC), Reinhard F. Hüttl (Euro-CASE), and Dermot Kelleher (FEAM; President until 2015), signed a Memorandum of Understanding in presence of Robert-Jan Smits (European Commission Director-General for Research and Innovation). The initiative highlighted the potential of a united voice of experts across all scientific disciplines and became the basis for the consortium comprising the five signatories. At ALLEA’s General Assembly in Lisbon in April 2015, Commissioner Moedas reaffirmed the major role that European academies can play as providers of impartial and evidence-based scientific advice to policymaking processes. 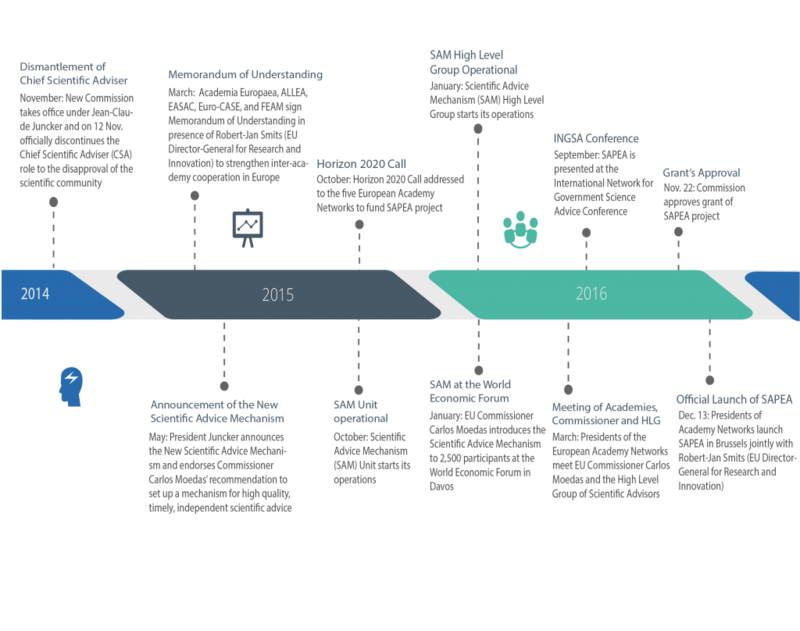 From mid-2015 to the beginning of 2016, several major steps led to the establishment of SAM under which SAPEA operates. In May 2015, President Juncker announced the creation of SAM and endorsed Commissioner Carlos Moedas’ recommendation to set up a mechanism for high quality, timely and independent scientific advice. The working structures of SAM were developed in spring and summer, and in October 2015 the official SAM Unit was established within the Directorate-General for Research and Innovation. In January 2016, the High Level Group of Scientific Advisors (HLG) started to be operational and agreed on the first issues to consider for scientific advice to the Commission. As part of their initial activities and to further strengthen the workings of SAM, the HLG met the Presidents of the European academy networks and Commissioner Moedas in Brussels in March 2016. In the meeting, the academy networks’ Presidents reiterated the importance of truly interdisciplinary approaches towards today’s societal challenges which the academies are in a privileged position to provide.